Since Cristiano Ronaldo arrived in Turin during half-time of the World Cup final, the sense of euphoria among Juventus supporters had barely begun to subside. With the Portuguese megastar in their colours and a team that has yet to lose a Serie A match in 2018/19, nothing was going to phase them. For Juventus, this Juventus, all that mattered was the Champions League and ending a 23-year wait to be crowned Europe’s best side. Sub-par performances were explained away as being necessary for a veteran team who had ambitions of securing a treble, fan protests over rising ticket prices were seen as a spoiled reaction from the Ultras while even a Coppa Italia exit at the hands of Atalanta was deemed immaterial. Then they faced Atletico Madrid. A trip to the Estadio Wanda Metropolitano was always going to be difficult, but for supporters who dreamed of lifting the trophy in that same venue this May, Diego Simeone’s men were viewed simply as the next obstacle. Instead, they brought the Old Lady to a screeching halt, notching a 2-0 victory that was so comprehensive it has forced those who watch the Bianconeri closely to question every single aspect of the club’s future. Max Allegri’s future as Coach has been a major focal point and, after five years in charge it is highly likely he moves on this summer even if he somehow steers his side past Atleti in the return leg. He’s currently 7/1 (Betfair) to be Real Madrid’s next manager, 16/1 (Paddy Power) to be in charge of Manchester United next season and 25/1 (BetVictor) to go to Chelsea. Having been at the helm so long, a fresh voice would almost certainly reinvigorate players who have begun to look jaded over the past few months and it is impossible to deny the fact that the team would benefit from some fresh ideas. Among the players, Leonardo Bonucci’s regression and Daniele Rugani’s lack of progress are seen as central to the defensive failings that were punished by Los Rojiblancos in the first leg. Yet even more than that pair of Italian internationals, perhaps the most divisive figure among supporters is the future of Paulo Dybala. To many, he is seen as a physical embodiment of Allegri’s failings, his lack of impact this term nothing more than a manifestation of the Coach’s inability to unleash the full potential of the attacking talent at his disposal. His performances have seen him banished to the right flank to make space for Ronaldo and forced him to hunt around in midfield for the ball, a meagre return of four league goals underlining just how marginalised the 25-year-old has become. For a player who has inherited the no.10 shirt previously worn by Michel Platini, Roberto Baggio and Alessandro Del Piero, it wasn’t supposed to be this way. His previous three seasons with the club had seen Dybala bag 52 goals in Serie A alone, his place as a cornerstone of the Bianconeri almost taken for granted as – along with Kylian Mbappé – he was regarded as the future of the sport once Ronaldo and Lionel Messi began to fade. Instead, he is playing in the shadow of one that duo, Juve pushing him aside in favour of a 34-year-old and the attention that signing CR7 would inevitably bring. This leads to a very interesting hypothesis for the summer and could present a very difficult situation for all parties involved. Ronaldo cannot maintain his incredibly high standards forever, but the Bianconeri have a duty to maximise the opportunity that his arrival has facilitated and they will never have a better chance to win the Champions League. That has already led to the sale of arguably Italy’s most promising central defender, 24-year-old Mattia Caldara given to AC Milan as part of the deal to reacquire 31-year-old Bonucci. In almost any other circumstances, such short term thinking could be deemed negligent, but a club cannot spend €112 million and completely smash their carefully-built wage structure to sign Ronaldo and then wait two years for young prospects to blossom. Instead, Juventus have created a world in which the future is something to worry about later and it is simply time to seize the moment. The defence clearly needs reinforcing, the midfield cannot continue to rely on cut-price bargains like Emre Can, Sami Khedira and Blaise Matuidi, while the attack has Federico Bernardeschi, Douglas Costa and Mario Mandzukic who all seem to fit much better alongside Ronaldo. So we arrive at a juncture where difficult decisions must be made. If Allegri – a Coach who has won four consecutive league-and-cup doubles in his first four seasons in charge and is almost certain (1/2000) to claim a fifth Serie A title this term –is likely to be replaced this summer, then is the idea of selling Dybala really that outlandish? Odds on him being a Real Madrid player next season have fallen to 6/4 (BetVictor), a price which indicates bookmakers are cautious about him moving on. He would certainly command a stratospheric transfer fee, somewhere between the €180 million Paris Saint-Germain paid for Mbappé and the €120 million Barcelona spent to acquire Philippe Coutinho. Such a sum would allow the Bianconeri to make the changes needed to their squad and finally deliver that long-awaited Champions League crown the Old Lady so desperately craves. 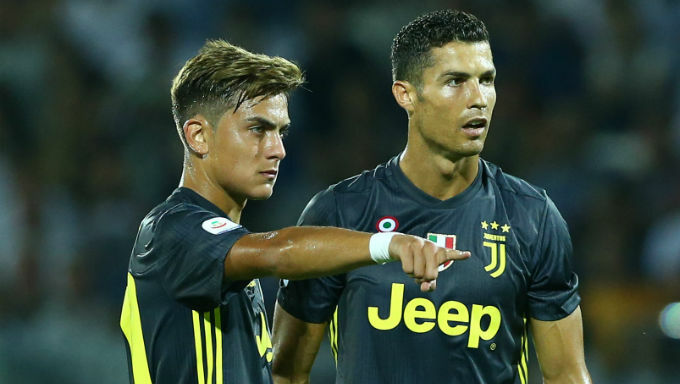 He has already ceded centre stage in Turin to Cristiano Ronaldo and, while Paulo Dybala is clearly a great player, he is also one his current club might need to sell in order for both him and Juventus themselves to be the best they can be.